An orbiting Shuttle was one of the brighter satellites that you could watch. 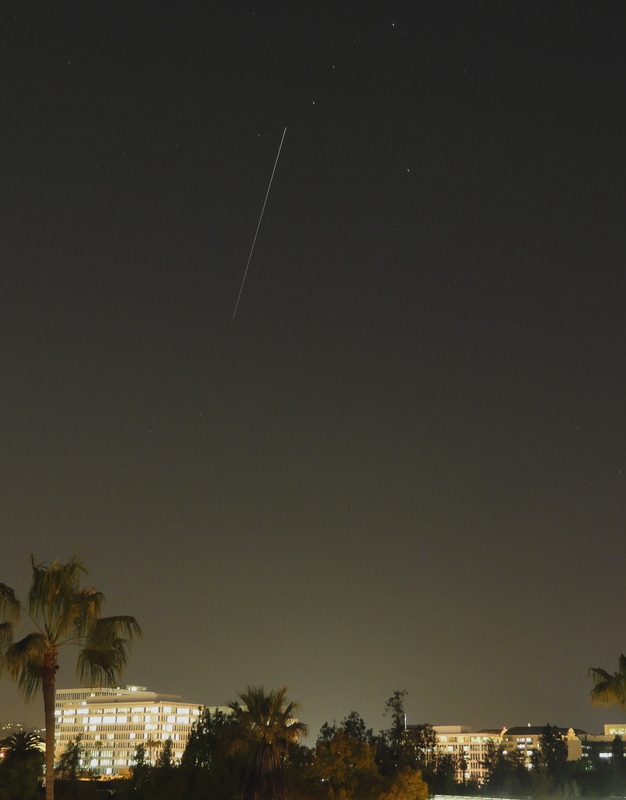 Only the ISS and Iridium satellites outshine a shuttle (but only for a very few seconds at a time!). There's another nice image from the same night here, taken by Adam Ince. 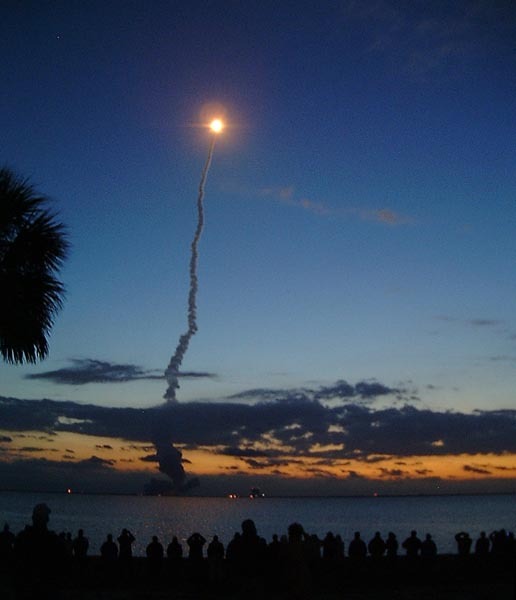 The photographs on this page are of the launch of the STS-109 Hubble refurbishment mission, which took place just before dawn on March 1, 2002. SkyLights follower Neil Wagner was present, and took these shots, using a digital camera, from Titusville (around 12 miles away). The shots posted here are considerably more compressed than Neil's originals, to save disk space and speed your downloading time. 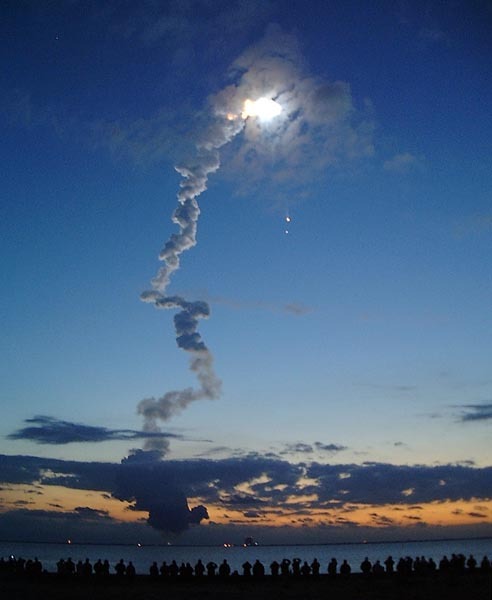 Shuttle Orbiter climbs into the dawn sky. SRB exhaust brilliantly lit by dawn's early light. The large structures associated with the ISS construction missions make for good viewing. Check the Heavens Above web site for predictions. NASA also provides country-by-country predictions. Their California city predictions can be handy, too. The shuttle orbiter was also visible while it re-entered the atmosphere, on its way to landing in Florida. Depending on the orbital track, folks in central California, Nevada, and Arizona were able to see the shuttle's glow and wake, especially when it took place before dawn. 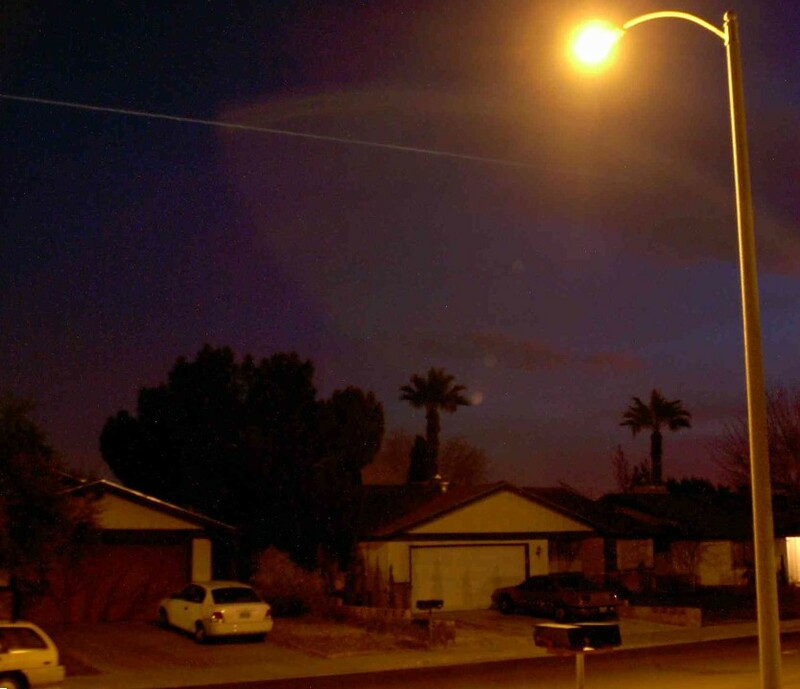 On the morning of February 1, 2003, 22-year-old shuttle orbiter Columbia was on its way to a landing when Vic Panegasser took this 8 second exposure of its passing, from his home in Las Vegas, Nevada. Very shortly after Vic took this photo, Columbia broke up over Texas. Another very interesting tidbit: It is actually possible to image the space station from the ground, without a military-sized budget. For details and example images, check out this site. Apparently, the SkyShow website has been down for a little while. You may wish to investigate the images and references at SatObs.org's website, instead. On Friday, June 22, 2007, at around 12:43 PM, I'm sitting at my keyboard, working away. Suddenly, I hear a pair of low-frequency BOOMs. I remember that the Shuttle had been waved off of at least one landing opportunity in Florida that morning. Given the sound, I'm fairly well convinced that I've just heard a re-entering Shuttle. I pay a quick visit to SpaceFlightNow.com, and sure enough, the Shuttle is on its way to Edwards AFB. I quickly tune in NASA TV in time to watch the shuttle making its turn on the HAC. I sent out a query to the subscribers list, asking who else heard the Shuttle coming in. No sonic booms in the San Fernando Valley, So Cal, however, we got to see it fly over about 4 minutes prior to touch down. It appeared to be in level flight heading approx 360 degrees. I was out in the front yard, here in Hesperia, waiting for it and it did not disappoint, good loud double boom you could feel in your lungs. Yup. I'm at Mira Mesa Blvd and 805. There's construction next door, and I though a truck hit the building or something. YEP! I HAD HEARD THAT THE SPACE SHUTTLE WAS GOING TO LAND AROUND 12:53 P.M. AND WAS WATCHING ON A LIVE STREAM FROM A LOCAL TV CHANNEL WHILE AT WORK. FUNNY, THOUGH, AS A LOT OF MY CO-WORKERS WERE NOT AWARE THAT THE SPACE SHUTTLE WAS LANDING AT EDWARDS AFB AND THOUGHT IT WAS AN EARTHQUAKE OR SOMETHING! I GOT A GOOD LAUGH FIRST AND THEN TOLD THEM IT WAS THE SPACE SHUTTLE COMING IN TO LAND. Yes we did! We heard it here in Lake Forest, CA (Orange County), at the same time that we were watching the approach on TV on breaking news on FOX Channel 11. It was so cool!!! The twin booms were NOT heard in Thousand Oaks, although a lot of people were outside listening. Yes. I did hear it. I was having lunch at Montgomery Field, but I didn't recognize what it was until I got back to work and read your email. Good call! We did - in Riverside. I ran to the TV with the kids and watched the landing. Bummer! Nope, nothing here in Glendale. Even though we are closer to Edwards AFB, we didn't hear it in the L.A. area, but then again the flight path was from the south, so I didn't think we'd hear it. If they had missed that window, we would have heard it on the next attempt as the path would have been from the west. As for passes, got a good look at the ISS last night, thanks to Heavens-Above.com. Another bright pass will come on Saturday (June 23) night. Living here in North Park, My first thought was that the neighbors were having a heated domestic furniture re-arrangement event, but when the news break mentioned sonic booms it did seem to correlate to the timing. Interesting was that it sounded like two booms then a brief pause followed by a repeat. very rhythmic cadence, unlike random noises during a squabble. Yep, that's weird that we didn't hear it, especially since I was outside and expecting it. I know they don't cross the threshold of Mach 1 until about 4 or 5 mins prior to landing, and I'm quite certain that's when the pop pop occurs. What I do know is, this entry approach came in right over San Diego heading north to EAFB. And, I couldn't see the Delta 2 two weeks ago either, though we were outside next to LAX and looking in the exact direction. A bit too bright outside, and too-clean burning kerosene engines. BTW: 2 of my brothers work at Rocketdyne (now P& W Rocketdyne) which builds the RS27 engines and more. Nope, didn't hear it out in Indio/La Quinta. But I watched the landing on TV and the NASA website. I have followed this mission very closely, as new ISS resident Clay Anderson is a college friend of mine. The International Space Station is a fairly bright orbital target. There are various ways of tracking ISS on your own, but the easiest way is to let someone else do your overflight predictions for you. Your best bet for viewing ISS is to visit Heavens-Above and get a prediction for your location.